The Vauxhall junior Queens have continued to rule the volleyball courts this season. 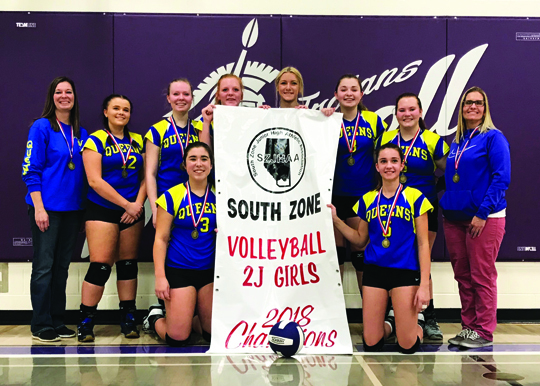 To begin November, the Queens won the South Zone 2J girls banner in Barnwell after running through the tournament with an undefeated record. Even with the team making it look easy, the coaching staff still experienced a few challenges along the way. “I was down to six players, I had eight to start with but I had two injuries so for the whole tournament I only had six girls. We went undefeated in the whole tournament,” said coach Sharla Huff. In the final, Vauxhall faced off against Seven Persons winning two of three sets 20-25, 25-15 and 15-5. The tier one Queens were comprised of five Grade 9 students and three Grade 8 students which lead to a nice mix of players the coaching staff could lean on in any situation. As with any other team though, the Queens had hurdles to overcome on their way to the 2J zone banner. While some may have wilted with a shortened bench, the Queens proved to have the physical and mental fortitude needed to win the tournament. Other than a couple injuries to a few players, Huff stated the Queens didn’t have any other major challenges to overcome. Even with the shortened bench, stamina may have been a challenge but the coaching staff did not sense any fatigue throughout their roster. With the volleyball season being a short one, team chemistry can always be a factor for teams and can lead to either to great success or failed expectations. While it took the team a bit of time to gel, by the end, they were as strong as any other team on the court.